Land.To ranchers, farmers, and growers, it's where they make their living. To ecologists, it's habitat. To most Canadians, small, suburban plots are their independent castles. Rebels, from mountain men to hippies, fled to the land from a world too complicated for them. Aboriginal people called it their hunting ground. For all of them having land meant self-sufficiency and economic security. That's just what Canadian settlers yearned for. By hard work and endurance they could own land, instead of toiling for the local lord in their European homelands. Furthermore, in Canada, these homesteaders could enter the middle class. For over 400 years the land of Canada provided its people with a mythology and a goal. Surely, something so important should come with instructions? Instead, settlers were left to make their own mistakes. Homesteading was easier for some. Ukranians in their sheepskin coats were practiced farmers, Swedish loggers had a lifetime of experience making a living in the cold north. Many others didn't. Even Canadian born farmers, moving westward, found circumstances very different from one province to another. Many had to alter their dreams. None more so that proponents of the 'back to the land' movement from the 1960s to the 1990s. Mind you, the urge to abandon a crass, mercenary, violent world, didn't originate in 1961. In the 1600s bands of people disgusted with society, went off to live in the woods. There are no reports on how long they stayed. We have more information on recent attempts. Canada saw a surge of young people who wanted to 'return to a more primitive, simple time, toil in the earth, learn the rhythms of nature', phrases all guaranteed to bring a cynical smile to the lips of anyone who'd actually gone out in a blizzard to feed cattle, watched drought parch the crops or agonized as seed rotted in the fields under heavy rain. Not all the 'hippies' lasted, but some really tried. One group who'd renounced such centres of evil as Miami, New York, and Montreal for the peaceful, harmonious B.C. interior, there to live a life attuned to consensus; were surprised and chagrined to find that others had had the same idea, (except for consensus), decades earlier, and that, they, being practical people, determined to make a living, not a political statement, had taken all the truly arable land. The latecomers were forced to raise whatever might thrive on hot, dry, stony ground. Goats, they decided, were the answer. Activists of the 1980s still speak in hushed tones of gatherings to which the group brought contributions of goat cheese, goat milk, and goat meat. Made for strong memories. Even experienced farmers could fail in new surroundings. 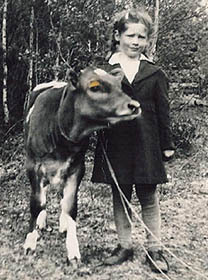 My Father, till he began to wander westward, worked on the family farm in placid, rural Ontario. 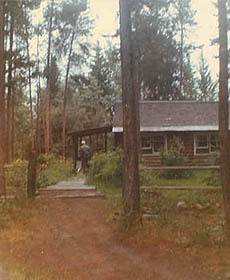 Drawing on this background, he assumed that his homestead in the pine and spruce forests of south-central B.C. was just the place to raise pigs. Now pigs are unexcelled at clearing property. They will kill trees and eat the roots, all the while fertilizing the soil. When the project's done, they can be eaten. Seemed like a sure thing. There was one complication. Black bears were in short supply around Kingston, Ontario, but they were prevalent in the untouched B.C. forests. And the ones near Father's homestead assumed that pigs were gifts from some kindly forest god hitherto unknown in their cosmology. Father determined to defend his pigs. He took his rifle and hid behind a tree near the pigs. Along came a bear, eager for a ham dinner. Father sighted in on the black pig-chomper. A shot, and down went the bear behind a small grove of poplar. Father congratulated himself on getting the bear so speedily when up popped the furry problem. Again he sighted, again he squeezed the trigger with the same satisfactory result. He was about to walk over and examine the body, when, against all odds, the bear rose again. This was too much. Giving the shot his deepest concentration, Father fired, yet again, at this seemingly immortal bruin. Over it went, just as it had the two previous times. However, this time there was no resurrection. At last, Father felt, if the bear was going to make another appearance, it had had plenty of time to do so. Cautiously he walked up to the bushes, which sheltered his victim. There lay three very dead black bears. He stopped raising pigs. Fifty years later, his daughter tried producing pigs on the same land and local bears reacted with the same gluttonous glee. Perhaps generations of bears, with the dogged faith of a Melanesian cargo cult transmitted the legend of delectable pigs to their offspring, warning them to be ready, should the opportunity occur again. They were. Reasoning that 'homesteading' implied raising animals, Father opted for goats. A wise choice, since his homesteading ambitions were conflicting with his desire to explore the surrounding mountains. The mountains won. Away he went, carrying his Trapper Nelson pack and rifle, with the flock of goats trotting cheerily along behind. Heidi in the Rockies. You couldn't do that with pigs. The goats excelled as mountaineers. The only mishap came when one small kid, crossing a fallen log over the rushing McLennan River, was mesmerized by the water. It began to lean dangerously part way across and toppled into the water. Fortunately, Father, who'd crossed first, was waiting downstream by an eddy and plucked the kid out as it came careening along. The goats were a success. Sheep may be among the most misjudged domestic animals. Their deceptively docile faces conceal irascible characters. Pity the innocent wannabe farmer who thinks that sheep are problem free. One successful sheep farmer failed to recognize that the ram had fallen in love with her until it knocked her into the sheep feeder and broke her arm trying to express its desires. Consider the sheep owner, thoughtfully repairing a gap in the pasture fence, who bent over to pick up a hammer completely unaware that, thirty feet away stood Wimpy, the ram, gauging the distance. Wimpy charged. Dave's head hit the fence so hard he had visions of the entire Milky Way. Sheep are sneaky animals. There isn't space enough to touch on the number of bulls which become totally enamoured of the wrong cows; generally cows of another breed, on the opposite side of the fence, and which, being just prisoners of love, crash through the fence, taking posts and wire with them. Love, vengeance, vulnerability, why isn't there a "Dr. Spock Talks To Farmers" for the unwary agriculturalist?